WASHINGTON -- President Donald Trump will announce plans next week to shrink two sprawling Utah national monuments by nearly two-thirds, an action that environmentalists and tribal leaders called illegal and another affront to Native Americans. Trump has already offended Native Americans by overriding tribal objections to approve the Dakota Access and Keystone XL oil pipelines and using a White House event honoring Navajo Code Talkers to take a political jab at a Democratic senator he has nicknamed "Pocahontas." Leaked documents obtained by The Associated Press show that Trump plans to shrink Bears Ears National Monument by nearly 85 percent and reduce Grand Staircase-Escalante National Monument by almost half. The plan would cut the total amount of land in the state's red rock country protected under monument status from more than 3.2 million acres (5,000 square miles) to about 1.2 million acres (1,875 square miles). 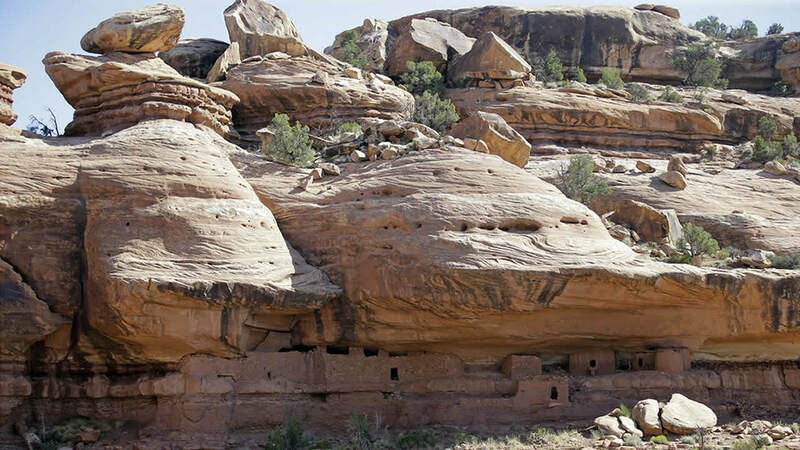 The proposals prompted an outcry from environmental groups, tribal leaders and others who say Trump's actions threaten important archaeological and cultural resources, especially Bears Ears, a more than 1.3 million-acre site in southeastern Utah that features thousands of Native American artifacts, including ancient cliff dwellings and petroglyphs. President Trump mocked Senator Elizabeth Warren of Massachusetts by calling her "Pocahontas" at a Navajo code talkers event. Trump has told Republican Sen. Orrin Hatch and other Utah officials that he will follow the recommendation of Interior Secretary Ryan Zinke to shrink both monuments, but the White House and Zinke's office have not offered details about how they'd redraw the monument boundaries. Trump is traveling to Utah on Monday and is expected to announce details about his plan to shrink the two monuments, the first and the largest monuments targeted for reduction by Trump after a review of monuments nationwide launched earlier this year. The proposed changes would be the most significant reductions by any president to monument designations made under the 1906 Antiquities Act, which gives the president wide authority to protect federal sites considered historic or geographically or culturally significant. Trump ordered Zinke to review 27 monuments created in the past two decades, with Bears Ears the top priority. Trump called some monument designations by his Democratic predecessors a "massive federal land grab" that "should never have happened." President Barack Obama created the Bears Ears monument last year after tribal leaders and environmental groups clamored for protection of land considered sacred by Native Americans. Grand Staircase-Escalante was created by President Bill Clinton in 1996. The Washington Post first reported on the documents, which include proclamations that will split up both monuments into several smaller ones that will be renamed. The plan would cut the overall size of Bears Ears from 1.35 million acres to 201,397 acres and Grand Staircase-Escalante from nearly 1.9 million acres to 997,490 acres. A spokeswoman for the Interior Department said the newspaper "has very old, outdated and inaccurate information." The spokeswoman, Heather Swift, declined to offer any other details. Utah's Republican leaders, including Hatch, have said the monuments declared by Obama and Clinton unnecessarily locked up too much land and asked Trump to shrink or rescind them. Hatch said in a statement Thursday that "details of the president's announcement are his and his alone to share," but added: "I appreciate his willingness to listen to my advice and even more importantly, to give the people of Utah a voice in this process." Trump's action, "following Secretary Zinke's fair, thorough and inclusive review, will represent a balanced solution and a win for everyone on all sides of this issue," Hatch said. Natalie Landreth, an attorney for the Native American Rights Fund, said her group has already drafted a lawsuit to challenge Trump's action, which she called unprecedented and illegal. "He will not be able to bask in one day of applause at the Salt Lake City airport" before being sued, she said. Randi Spivak, public lands program director at the Center for Biological Diversity, an environmental group, called Trump's actions a disgrace. "He wants to turn public lands over to corporations to mine, frack, bulldoze and clear-cut until there's nothing left," she said.